Understanding the High Cost and Infinite Value of Following JesusLet John MacArthur personally guide you deeper into the biblical truths of Hard to Believe—truths that triumph over the world's false view of Christianity. In this workbook, pastor, teacher, and best-selling author John MacArthur, takes you step by step through each main idea of his insightful and sometimes shocking new book. It includes a six-part study guide for every chapter plus special features, including: key quotations from the book, daily prayers, Bible readings, study questions, and notes and answers for discussion leaders. The content has been divided so that the introduction and twelve chapters can be studied personally and/or discussed by a small group in twelve sessions. There is no user-friendly, seeker-sensitive Gospel. Let John MacArthur personally guide you deeper into the biblical truths of Hard to Believe?truths that triumph over the world's false view of Christianity. 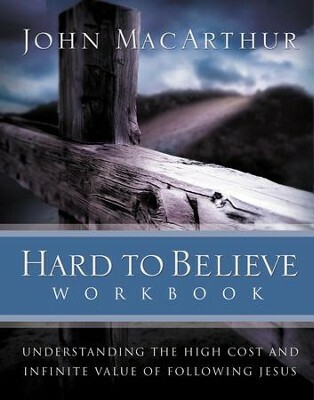 In this workbook, pastor, teacher, and best-selling author John MacArthur takes you step by step through each main idea of his insightful and sometimes shocking new book, Hard to Believe. These interactive lessons reaffirm that watered-down Christianity is really no Christianity at all, and that true faith must be defended in a cynical yet tolerant world regardless of the cost. Jesus instructs would-be Christians to deny themselves, take up their crosses daily, and follow Him. It is a tremendous journey filled with pain and sacrifice, but one that ultimately leads to a joy beyond measure?because the reward is eternal life. The Hard to Believe Workbook includes a six-part study guide for every chapter plus special features, including key quotations from the book; daily prayers, Bible readings, and study questions; notes and answers for discussion leaders; and much more. Short of having Pastor MacArthur in your living room or Bible study class, the Hard to Believe Workbook is the best way possible to fully experience his life-changing insights into the high cost and infinite value of following Jesus. I'm the author/artist and I want to review Hard to Believe Workbook: The High Cost and Infinite Value of Following Jesus - eBook.